The wave on our Centurion SV233 is produced by over 4000 lb. of ballast. We begin by filling two QuickFill compartments that are flooded with 1000 lb. of lake water in 15-20 seconds, building the base for the best wave on the lake. From there, we fill up the “Pro” surf sack on the side of your choice (port = regular foot; starboard = goofy foot) weighing in at @ 1300 lb. that run below the passenger seating, along with a 700 lb. “Plug-N-Play” surf sack on the same side. To top it off, we add 500 lb. of lead weight consisting of (10) 50 lb. bags that can be quickly moved around the boat to dial in the wave! The entire setup process takes less than 5 minutes. We believe in surfing safe and not overloading our boat (but we’ve been known to get our rub rails wet 🙂 We think you’ll agree that the Centurion Enzo SV233 throws one of the best surf waves on the lake! 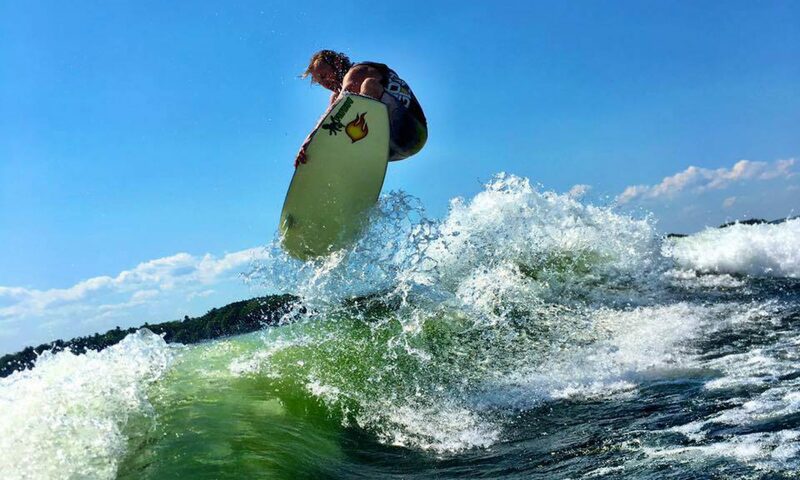 For more information about wakesurfing, check out our FAQs.